In a space with dark coloured interiors, Swiss Hardwoods- White fumed 5% engineered wood floor is a clever choice as it pulls light into the room and provides rich contrast. Planks with interlocking mechanisms. Engineered wood isn’t as sensitive to moisture and have a higher tolerance to temperature fluctuation. 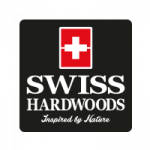 Swiss hardwoods use the hugely successful and patented Uni Click glue less locking system to hold the planks together and thereby the whole installation can be laid as a floating floor leaving with a small gap around the perimeter to allow minimal expansion and contraction in extreme climatic conditions so the floor wont buckle or warp.